MINNEAPOLIS, MN (July 6, 2009) – MillerCoors and the National Newspaper Publishers Association (NNPA) are proud to continue their 18-year partnership in presenting the A. Philip Randolph Messenger Awards for 2009, to select journalists with America’s Black Press. The award is named for the late, pioneering civil rights leader, A. Philip Randolph, and the first black newspaper, The Messenger, which he founded in 1917. Pictured above with MillerCoors executives at this year’s MillerCoors A. Philip Randolph Messenger Awards NNPA reception in Minneapolis recently are several of the nation’s premier African American journalists and publishers. 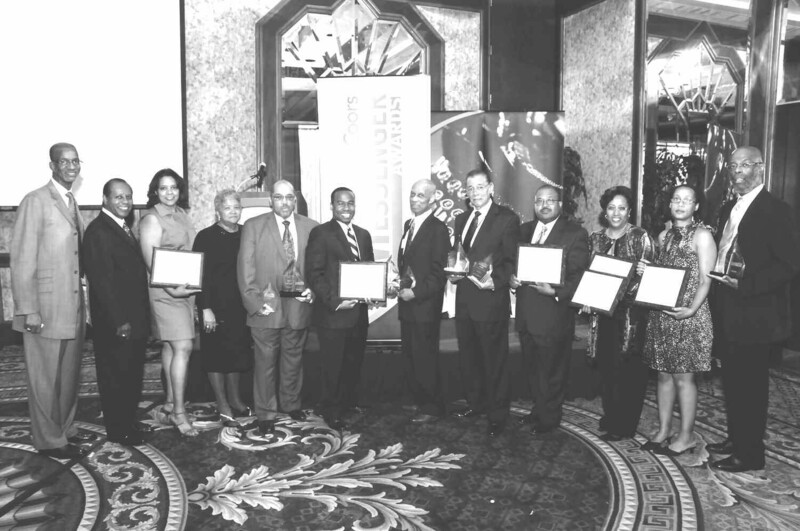 Among them are (from left) Moses Brewer, director, Multicultural Relations – African American Markets, MillerCoors; Larry Waters, director, Multicultural Relations, MillerCoors; Frances Jackson, The Chicago Defender; Dorothy Leavell, Chairwoman of NNPA Foundation; Michael House, president, The Chicago Defender; Clyde Jiles, The Houston Defender; Bernie Foster, publisher, The Skanner; Rod Doss, publisher, The New Pittsburgh Courier; Irv Randolph, managing editor, The Philadelphia Tribune; Sonny Jiles, publisher, The Houston Defender ; Dina Suggs, The St. Louis American and James Washington, publisher, The Dallas Weekly. The winning journalists for 2009 received a total of $25,000, with an additional $500 going to each of the ten finalists.